We visited Dover on our way to a holiday in France. We were booked on an early morning ferry and so stayed at Holiday-inn Express in Folkestone. We first had a day out at Dover. We arrived during the afternoon and spent a few hours visiting Dover Castle. Dover Castle is an English Heritage site. I was already thinking about joining English Heritage since visiting Birdoswald Roman Fort (on Hadrian's wall). The cost of family membership of English Heritage was about twice the amount it would have cost to have bought tickets for the one visit and provides free admission to all English Heritage properties throughout the year. I joined for the year so will be visiting other English Heritage properties throughout this year. The day that we visited was a public holiday and a special World War II weekend. As a result there were a lot of additional activities on, but there were also a lot of visitors at the site. Dover castle is a unique place to visit, the main tower at the castle is a scene from medieval times decorated in the style of King Henry II, but it also includes war time tunnels providing a World War 2 experience. We were lucky in being able to get a car parking space near to the main information building. But there is a regular land train to the other car parks, which were further up the hill. The main tower, which is decorated as though King Henry II, was in residence was really good. 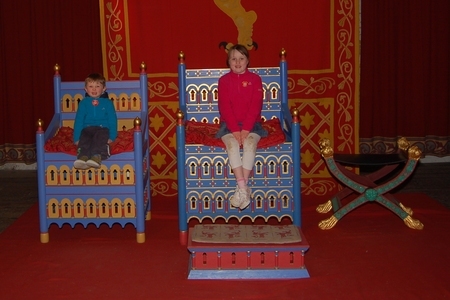 There was sufficient replica furniture in the rooms that our children found it interesting to look around, including pretending to eat a meal in the main hall and and sitting in the thrones. The view from the top of the tower was well worth the climb up all the stairs. There were very long queues for the two World War 2 tunnels. I expect this being a public holiday and a special event contributed somewhat to the queues. As we only had half a day we were not able to go into the lower tunnel showing Operation Dynamo, but after about a 40 minute wait we did go into the underground hospital. The tour through the hospital was worth the wait, it included a tour guide and various audio and visual effects to tell the story of a patient entering the hospital, through to the operating theatre (during an air raid) and also looking at the living quarters. There is a restaurant though we didn't eat on this occasion. It's one of the more expensive English Heritage properties to visit, but worthwhile. It's worth looking at joining as a member if you are likely to visit other English Heritage sites over the next year. Unfortunately we then went into a car wash that pulled a chunk off the back of the car, which put a real damper on what was otherwise a good day out. Not what you wanted before starting on a driving holiday to France, but fortunately the damage wasn't severe enough to prevent us using the car. After visiting the castle we went for something to eat. We had a short drive through Dover and didn't see any family friendly restaurants. I wasn't sure what the hotel would have for food (as it is located away from any town etc), so found a Beefeater in the TomTom. We went to The Plough Beefeater Restaurant which was part of the way back towards Folkestone. We had a good meal there and then went back to the hotel. The Holiday-inn Express in Folkestone is located close to the Channel Tunnel terminal. It is a nice modern hotel, and does serve food, although it is a fairly limited menu. We had an early start the next day, but the free breakfast buffet was open with hot and cold breakfast. Considering it's right next to the train lines we didn't hear a single train whilst we were there. I'm not sure if that's because there are no trains running in the evening, or perhaps there was a reduced service due to the public holiday. The hotel is about 20 mins drive from the ferry at Dover.